We always start out meaning well. We are going to mix the lunches up a bit for our children. We promise ourselves that we won’t make another Peanut Butter and Jelly Sandwich or (God forbid) buy another pre-made lunch from the store. Like any parent, I’m concerned about the nutrition that my children are getting during their lunch time at school. I remember the lunches that I used to eat in the cafeteria when I was a child. I used to be able to see my own reflection in the cheese of the pizza! So, my wife and I thought it would be best to just take matters into our own hands and make our own lunches for our children. 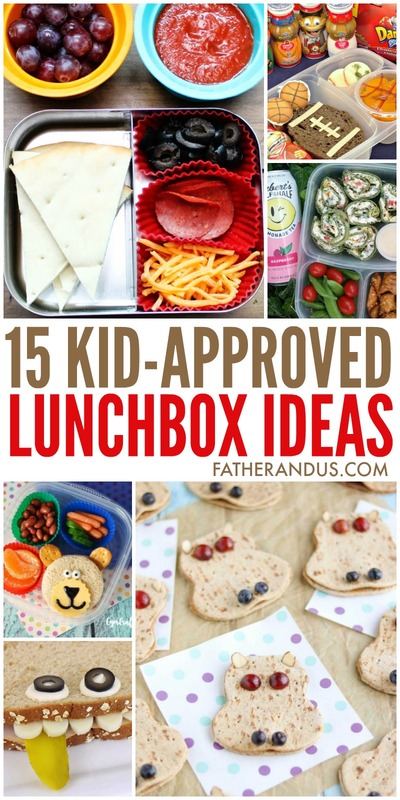 So, we began looking for some great easy lunchbox ideas. Well, it didn’t take long for that plan to fall apart. We would be too tired from the hectic day to make the lunches before we go to bed. Then, we would be in too much of a hurry to put much effort into making their lunches in the chaos of the morning. Then, next thing that you know, we’d be stuffing that PB&J into a sandwich baggie and shooing them off to the bus stop. On the morning when we did make them something different, my son would bring his lunch box home with most of it still left. My son is a super picky eater and doesn’t like to try anything new. So, the challenge was to find some fun and easy lunchbox ideas for their school lunch. They had to not not only be fun and easy, but also nutritious. We scoured the internet for some ideas and I thought I’d round them up for you to check out. I’m hoping these kid-approved easy lunchbox ideas will make your morning a little easier and your child’s school lunch a little more fun!